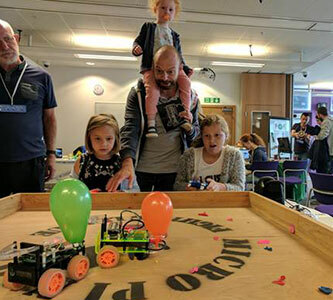 Check out the attractions and activates we have lined for for you at Makers Central 2019 so far. 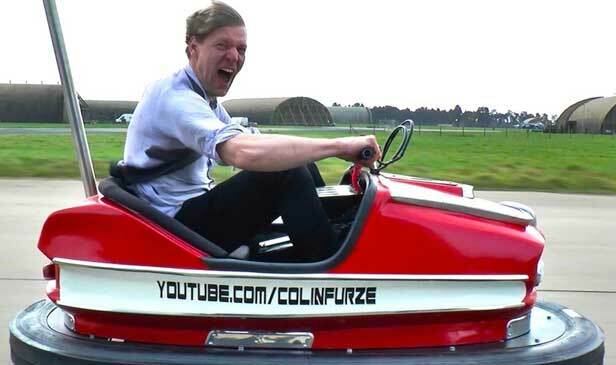 Colin Furze is a YouTube personality, stuntman, inventor, and filmmaker, from Stamford, Lincolnshire, England. 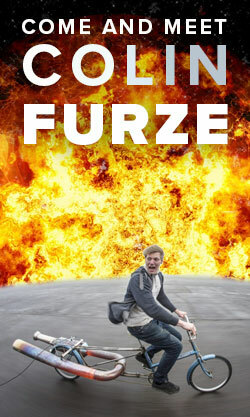 Furze left school to become a plumber, a trade which he pursued until joining the Sky1 programme Gadget Geeks. 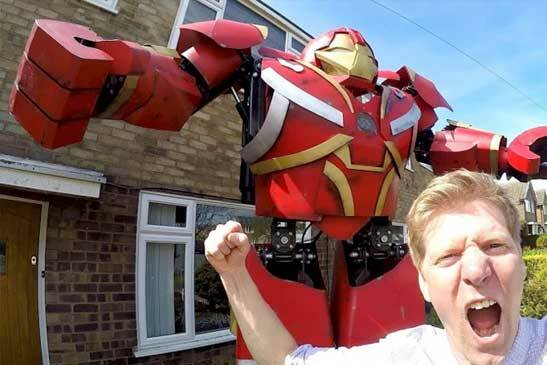 Colin will be bringing along many of his cool inventions and will be on stage both days . We hope you’re as excited as we are to see Colin and all of his cool projects. Colin doesn’t do public appearances that often so don’t miss this opportunity to see this YouTube legend! Makers Central are pleased to welcome Zoe, Emy & Victoria the hand built droids by Pod Pad Studios. 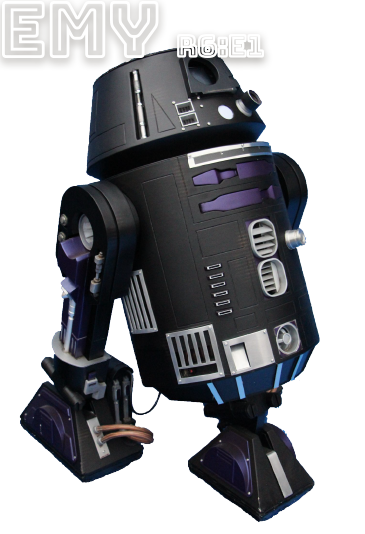 These droids have been built based on the famous Sci-fi movies Star Wars & Dr Who. 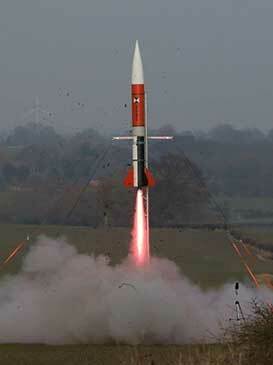 Crusade Rocketry was formed in 2017 when amateur high-power rocketry enthusiasts Martyn Turner, Russ Strand, and Keith Strand decided they wanted to build and launch something big…. really big. 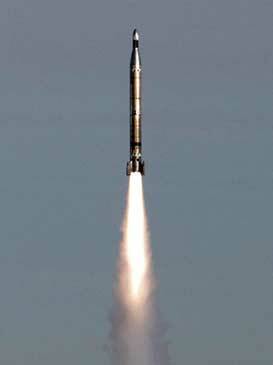 They are planning to build and launch a full-scale replica of the Black Knight rocket that was a product of the early British Space Program. While their Black Knight replica will not reach space, it is expected to fly to several thousand feet and provide for a truly memorable experience. The path to this goal, culminating in a launch, is intended to honour the legacy of the British Space Program, as well as inspiring young people in education to pursue STEM subjects. 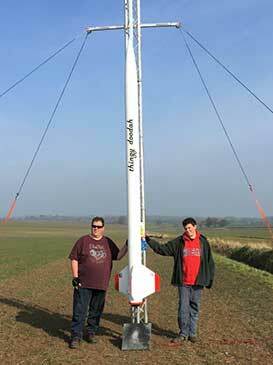 Come and visit the team at Maker Central 2019 to find out more about the project, amateur rocketry in the UK, and how they as makers go about designing and building these remarkable creations. Building your own jet engine might be easier than you think! 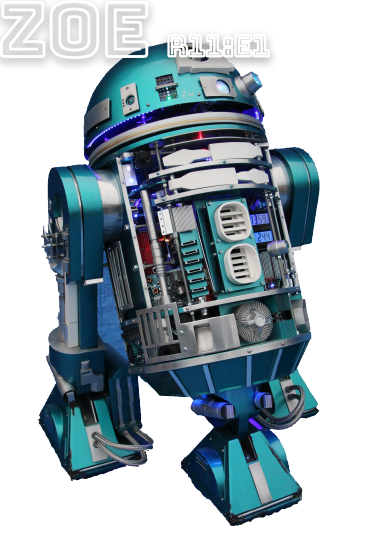 Bristling with technology, the sophisticated R2D2 styled Zoe is full of character and loves moving round at events, interacting with her fans. Radio control, with a projector (with princess Leia images), moving utility arms, and sounds that trigger on movement nearby. Zoe is both a cheeky crowd pleaser, and just as entertaining up close! Children often follow Zoe in her travels around indoor events, fascinated by the experience of meeting a Star Wars icon in person. Steam, light, sound, action! Steampunk meets Dr Who, in Vicky, our dalek with attitude. Carrying her own mini mechanical mutant, which moves independently, rotating mini gun, water cannon and steam system, she fascinates when stationary - but is most impressive when in motion. 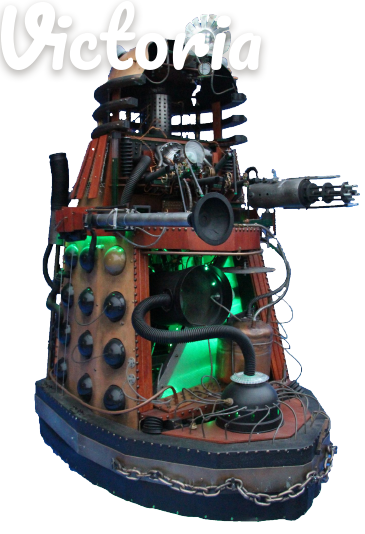 Her sound system draws the crowds, and provides the music for dance offs with other daleks at Sci-fi shows. 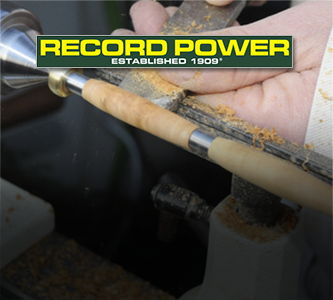 The Record Power team will have highly experienced woodturning demonstrators and tutors to help guide you to make your very own pen. Record Power will have several lathes available throughout the weekend to allow as many people to try their hand at making a pen for FREE! People wishing to give this a go should head on over to the record power stand located next to the YouTube Makers Zone and put your name down on the list. Limited spaces available for turning your own pen so please get your name down early to avoid disappointment. Safe use will be the priority with encouragement and support to try and ensure successful completion of the project. The team at 3D Parrot will be at the show with their amazing life size 3D printer. This amazing piece of technology can create a bespoke full-colour 3D printed statuette of you and your loved ones. These capture moments in time unlike any photo you’ve ever seen before. These statues make brilliant mementos or gifts for any occasion. The 3D scanner we take over 100 photos from different angles in less than half a second to ensure we capture every detail of you and your outfit. These photos are then used to create a virtual model of you from which we can print a statuette. Come and see the 3D Parrot and get yourself printed! 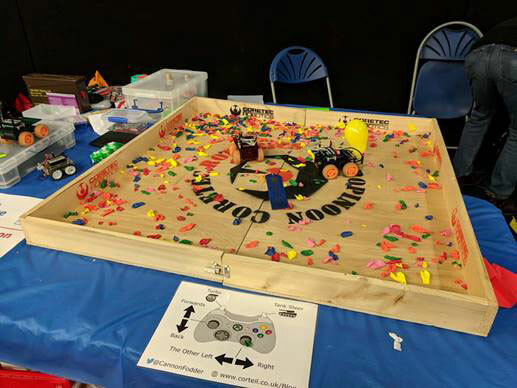 The Makers Central team have got together with the Creation Station a professional company that will provide an amazing experience for your little ones throughout the whole weekend. 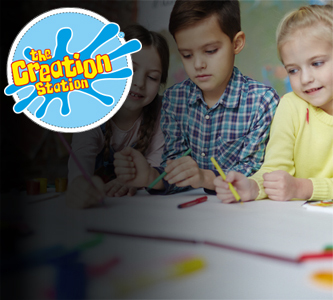 The Creation Station are multi-award-winning, five-star rated company who inspire over 15,000 children and families every week with their creative arts and crafts experiences across the UK. 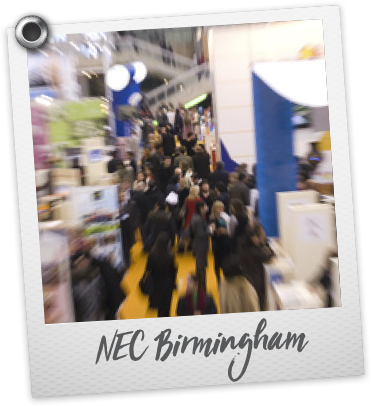 Their friendly, nurturing and professional trained team of 130 Creation Station leaders are based right across the UK. The majority are mums so they empathise with children and parents alike. All the activities they run are tried and tested. With their own warehouse of 12,000 art and crafts products they ensure all the products used are fit for purpose and have the appropriate safety documentation. The kids workshop will allow your kids to try all arts and crafts and it’s our mission to inspire them into creating and making. The kids workshops will be located at the top of the hall near the food court. 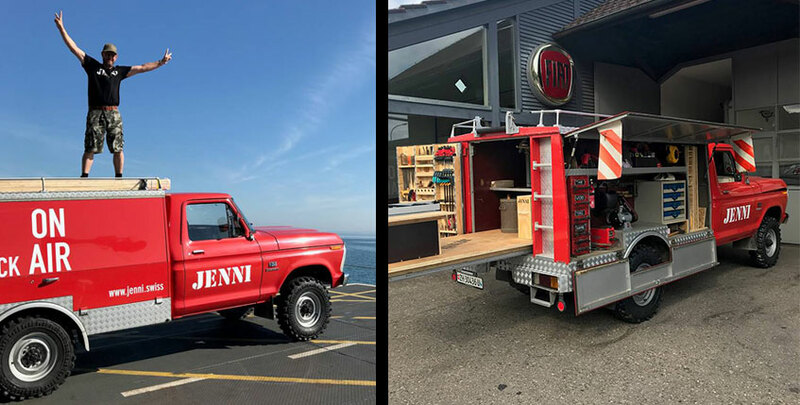 The Maker Truck is the traveling workshop of youtuber Jenni Swiss. 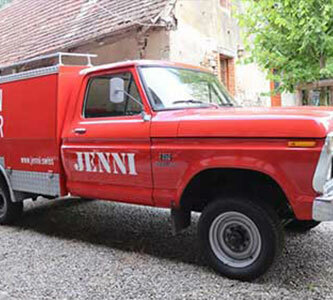 The converted fire truck includes a complete joinery, a metal workshop and a sewing studio! Visit The Maker Truck by Jenni Swiss and watch him and his Youtube-maker friends with many surprises. 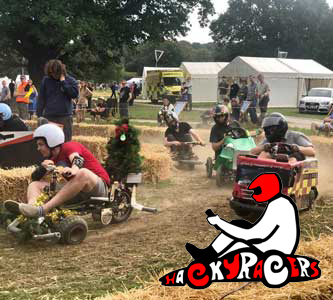 Come and check out Hacky racers as they race their handmade electric cars! Come and check out Brian Corteil's incredible balloon popping robots! 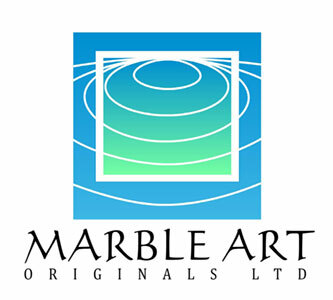 We are Marble Art Originals Ltd. Trading as Marbling 4 Fun at exhibitions all over the United Kingdom. Marbling is a mesmerizing, memorable and rewarding experience for teachers and pupils alike. The designer and director, Craig Joubert has been marbling since 1992. He inspires and empowers your marbling practice with free tutorial videos. 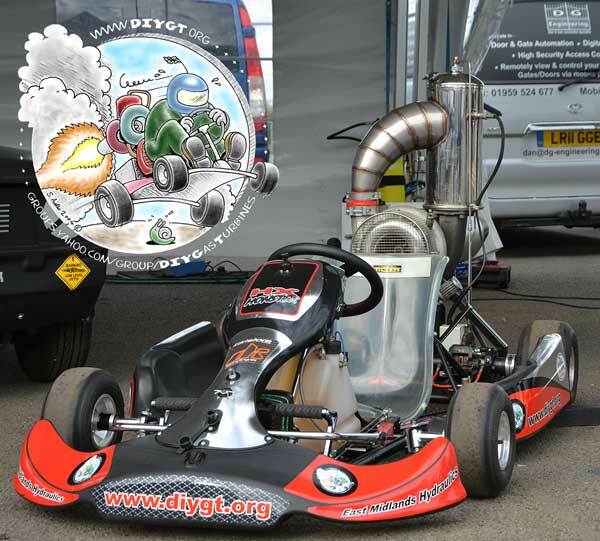 His kits are exceptional quick drying formulated water based permanent paints. 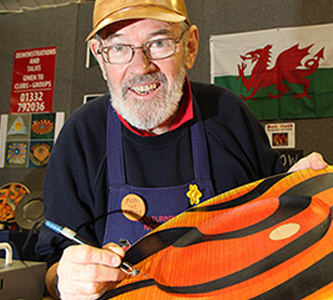 Craig can be seen at various exhibitions giving demonstrations and workshop teaching this ancient craft to all ages. Eli-Chem Resins’ range of clear artwork & woodworking resins has been formulated with the needs & passion of artists, creators and woodworkers in mind. The resins are U.V stabilised & ASTM certified non-toxic and non-hazardous. We also have a wide range of opaque and metallic pigments that are light-fast and are specifically designed to hold their colour for many years. We are the U.K’s largest supplier of photo-luminescent ( glow in the dark ) pigment powders, pebbles and gravel. 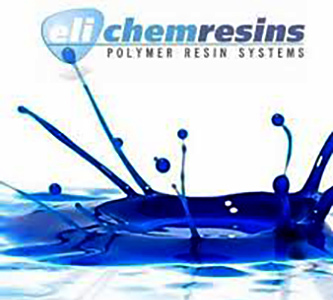 Eli-Chem Resins is a UK company and proudly distribute our range of resins and pigments throughout the world ( to over 65 countries ). We will be doing 2-3 demonstrations each day on the stand showcasing our latest art and woodworking resin products. There is no need to reserve a place for these sessions, just come by and watch them take place !. Gary Lowe will be on the Chestnut Products stand located near the main entrance at Makers Central this year. Gary is a registered professional woodturner and has gained an enormous amount of respect in the turning world. Gary makes some fabulous pieces so pop on over to the Chestnut stand and watch Gary in action. *Gary will be doing demos on set times during the weekend. Times will be displayed in the show booklet. Come and take the Triton challenge, beat the buzzer and win a prize. Triton Tools will be hosting a ‘Beat The Buzzer’ competition throughout the weekend and if you beat the buzzer you will get a FREE gift. The competition is open to anyone at the show and will be running all weekend. Come and watch Lee Stoffer carve a spoon or bowl. 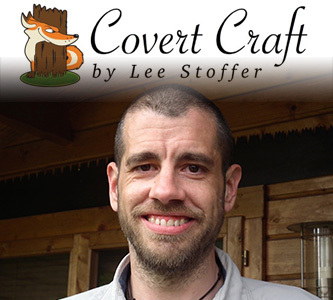 Lee has been carving for about 10 years now and carves a variety of British hardwoods. His skills are tremendous to watch so why not head on over to the Cover Craft stand and watch Lee and his team in action. 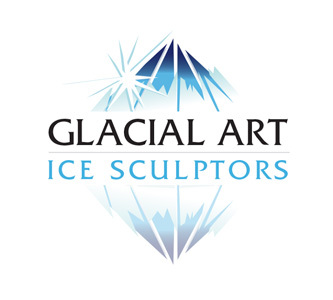 Glacial Art Ice Sculptors are proud to be the only ice sculpting company in the UK to have at its heart two international ice sculpture champions, a true indication of our passion for the craft. We will be at Makers Central for both days and will be showing you how to carve sculptures out of ice. You can even give it a go yourself….. The challenge is to build a structure strong enough to hold half a brick using only the materials provided on the day. 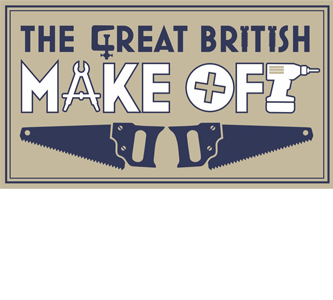 Bob Neill will be hosting childrens workshops involving creating your own door plaque, coaster or key fob. A great recreational activity for the kids! Believe it or not, almost anyone can build their own jet engine using materials as simple as old auto parts and a few pipe fittings. These engines are not toys, they are real jet engines built by keen individuals. They come in all manner of shapes and sizes. DIY GasTurbines is an online group with members World wide. Ready to help with advise and support for anyone thinking of undertaking the challenge of building there own jet engine. 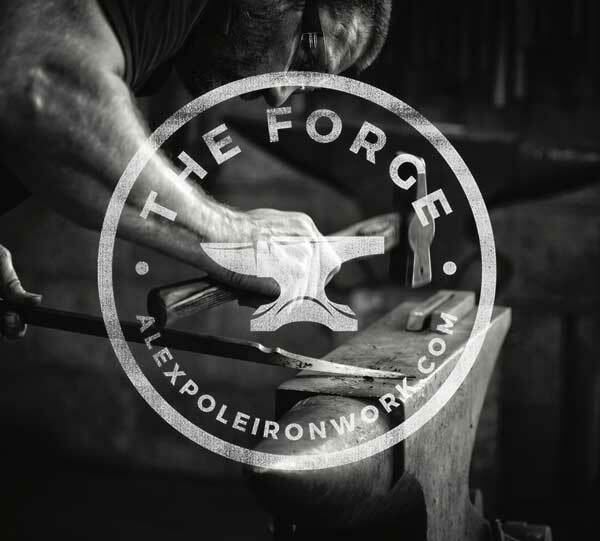 The forge is run by Alex Pole, Steve from Moonshine Metalworks and Joe Garnett. These three will show that blacksmithing is far from a dying art and is far more accessible than you may have realised! The Forge will be run by 3 professionals, Alex Pole, Joe Garnett & Stephen House and they will be running ‘have a go sessions’ throughout the whole weekend. Each session will run for 15-20 minutes and you will make your very own nail to take home with you free of charge. To take part put up to ‘The Forge’ and put your name down for a time slot on the day. Make with Makers Hands-On Building and Crafting with Awesome Makers This is your chance to get stuck in at Makers Central; not just watching but actually making things you can take home. 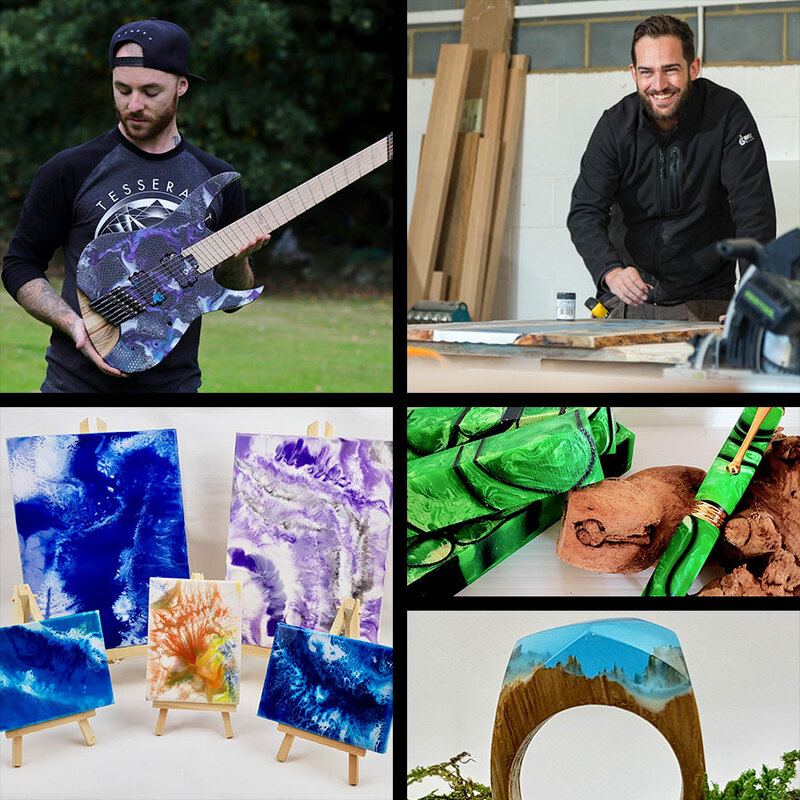 From woodworkers to leatherworkers, crafters and sewers, Makers you know from YouTube, Instagram, and podcasts have come from all around the world to run workshops throughout the weekend. What’s more fun than making? Making with Makers! Craftiv8 is a Craft Technology company. Our products are developed to cross material and subjects, to expose crafters to new technology, materials and methods for their crafting. We are redefining what craft is. STEAMing ahead to brand new types of crafts, including Science, Technology, Engineering, Arts and Maths. Galactic Plastic is Craftiv8’s premier product and is a new art medium that can be sculpted, moulded, carved, stamped and used a paint and lots more. It is totally non-toxic and is reusable so there is no waste in your creations. Just heat the material to 90c to use it like a putty or just to 60c to bend a sheet into a shape. It can be heated in the microwave or with low temperature heat tools. Melt it! Marble it! Mark it! Mould it! Lámha Craft Shauna is a creative artist and designer based in Dublin, Ireland. She attended NCAD (The National College of Art and Design) Ireland and has a B(Des) Hons in Craft Design. She specialises in mould making, life casting, ceramics, glass and more recently has applied her artistic flair to body painting and special effects. 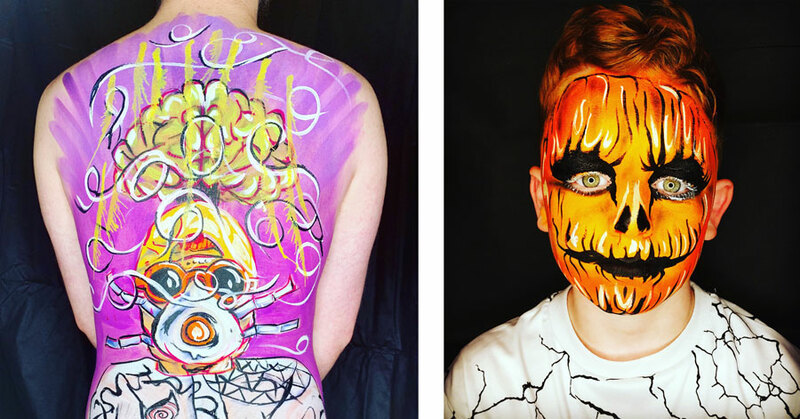 She competed in the Irish Body Painting Championships in February 2019 and placed 3rd in Ireland in the Freestyle category. Shauna’s body painting work can be seen on her Facebook page Shauna SFX and Instagram shauna_sfx linked bellow. She will be Facepainting over the course of our event so their stall will definitely be one to see if you’re attending as a family! 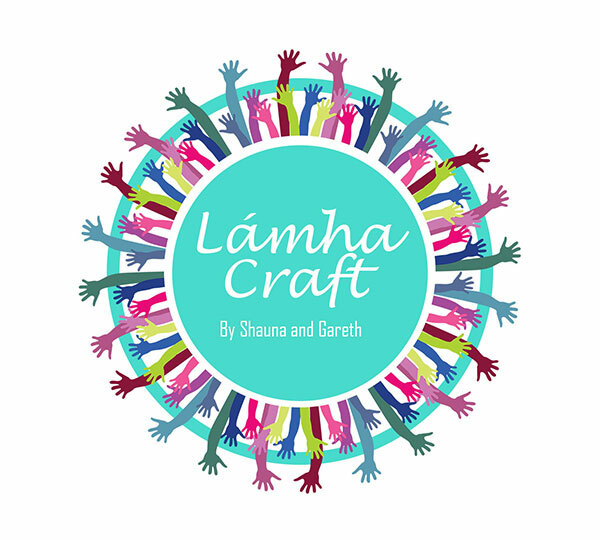 Lámha Craft, or ‘Hands Craft’ in the English translation is a collaborative project Shauna has been working on with her father Gareth to be launched at Makers Central 2019. Gareth is a creative woodworker and jack of all trades hailing from Dublin, Ireland. He is the father to nine children, Shauna being the eldest and loves to put his hands to making exciting artworks in his spare time. 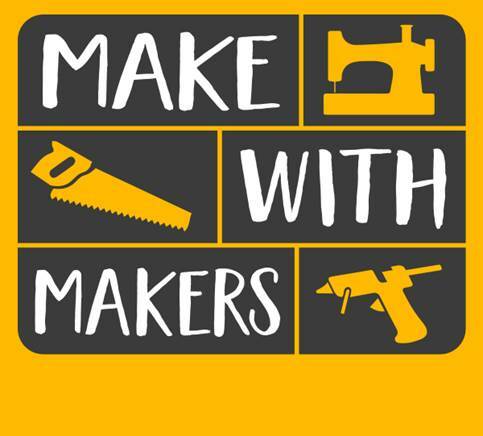 Gareth and Shauna have collaborated specifically with Makers Central in mind. Together they’ve taken ‘life casts’ of hands given them each a unique function. With Shauna taking the casts and making the moulds; and Gareth fitting and finishing them they make an awesome team duo! They will be selling these life casts at the festival and they are certainly not to be missed. With functions such as family ‘hand’ coat hangers, ‘hand’ key holders, ‘hand’ ring displays, ‘finger’ jewellery organisers you’re sure to find a quirky piece to suit your needs. Further updates of the Lámha Craft project can be seen at www.shaunacraftdesign.com along with various other crafted items they will have on offer at Makers Central this year. After four years intensive R&D, inspiration, design and build, Micromagic Systems is proud to unveil Mantis -- the biggest, all-terrain operational hexapod robot in the world. 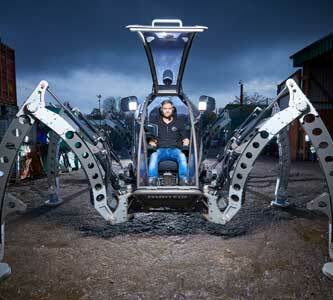 This 2.2-litre Turbo Diesel-powered, British-designed and -built walking machine can be piloted or remote wifi-controlled, stands 2.8 metres high with a five meter working envelope and weighing in at just under two tonnes. On 15th January 2017 Mantis was awarded the Guinness World Records Certificate for the largest rideable hexapod robot. "This is definitely the largest hexapod we have built so far," says Micromagic founder and Mantis' chief designer Matt Denton. "This walking machine started as an idea back in 2007, we secured private funding in 2009 to start the project and - after three years of design, build and testing - the robot made a first successful test drive in the summer of 2012 at Bestival UK." There are some great talks and demos at the House of Resin stand; learn about river table making, combining wood and resin, turning resin on a lathe, wood stabilising, resin inlays in wood, and even knife blade heat treating! Ed Gunter will be bringing one of Revive Joinery’s show-stopping river tables. Ed will be sharing some insights in river table making with EcoPoxy Resin. The table is being made right now, check @revivejoinery on Instagram! Live resin casting with Brian Blohm, Caster’s Choice Mica Powders. Brian is joining us all the way from Dallas Fort Worth, USA and will be casting resin blanks every 90 minutes at the stand, with the blanks available for viewing (and sale) 90 minutes later. Hybrid wood and resin turning talk with John Clothier. The well-known contemporary wood turner and YouTube artist will be talking through his experience of creating resin spheres on the lathe. Zac Higgins, NV Woodwerks, USA - Zac’s popular resin casting YouTube channel has been running since 2014. He is passionate about helping others get started. Zac will be holding a talk at our stand on wood stabilising, showing some of the great products available, and will finish with a Q&A session. Don't miss this chance to meet one of the resin masters! Resin talk by Max Dawe, owner and maker at Tobias Caspar (formerly Dawe Luthiery). Max creates bespoke functional art in the form of musical instruments and furniture. 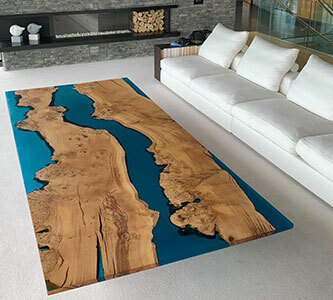 He’ll talk about resin river tables, dimension blocks and inlays in wood using Alumilite Amazing Clear Cast Resin. Pam Harris, Highland Boxes - self-taught YouTube artist and maker Pam started her woodworking journey only 7 years ago. Lots of trial and error and many YouTube sessions later she’s a respected maker and seller. Pam will be chatting about her work involving resin and wood - boxes, pens, jewellery, rings, and resin wall art pours. Mark Lewin from TQ Blanks has been producing high-quality resin and hybrid blanks for the last 2 years. They incorporate real diamond dust and specialists woods from around world. Mark will be talking and showing some of his blanks, and sharing his experiences with larger resin castings, like river tables. Alex Pole runs blacksmithing courses at The Forge in Somerset and comes to Makers Central fresh from a teaching trip in Norway! Alex will be at the House of Resin stand talking about heat treating axes and knives in the Paragon KM18T electric kiln. Silverclay demonstrations - Live Alchemy! with Magic Minx, Leigh Armstrong. You might recognise Leigh with her shocking-pink hair from Hochanda TV. 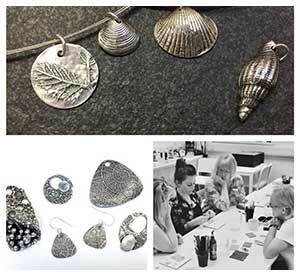 Experienced metal clay artist Leigh will be demonstrating the magic of metal clay; it starts out as a clay-looking material and ends up as pure fine real silver. It’s easy to work with, and doesn’t require a huge setup cost or training. We'll be demoing regularly throughout both days! Make your own rubber stamps from drawings, writing and photographs! 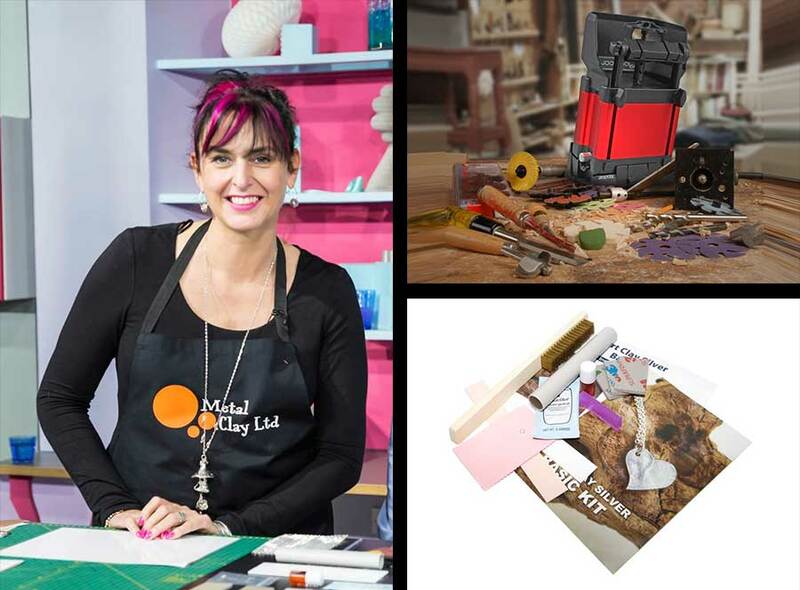 Lisa from ImagePac Stampmaker will be showing you an easy way of making your own stamps to use in paper crafting as well as clay making for personalised unique textures. 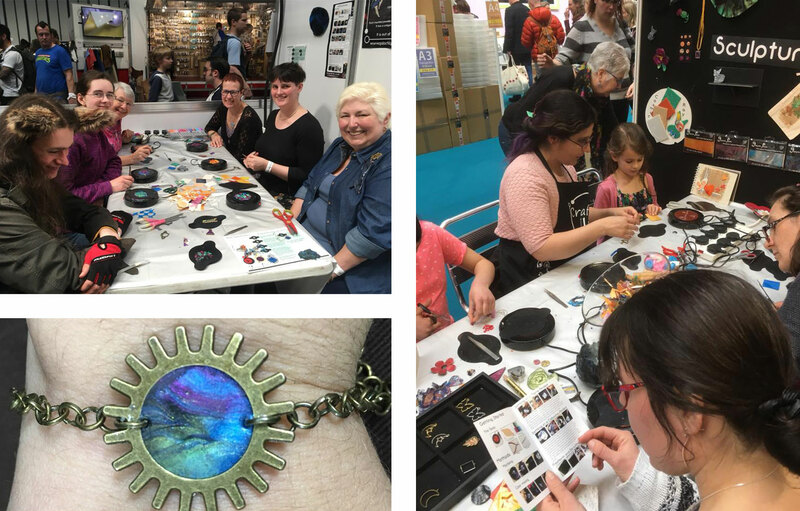 Clare Horner will be demonstrating the JoolTool - the wonder-machine from California, which polishes, grinds, sharpens, shapes (as well as replaces your flexshaft) resin, metal, wood, plastic, glass, enamel, silver, and many other materials! 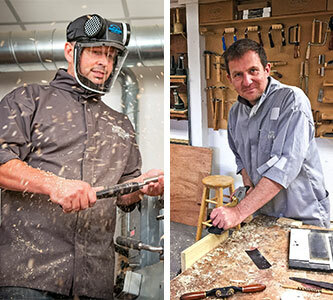 Well known in the world of woodworking and woodturning, Jason Breach and Colwin Way will be encouraging you to have a go. Jason will offer support with hands-on dovetailing, making small boxes and freehand routing nameplates. Colwin will guide and show you how to turn a spinning top to take away.